For a some time now we have been wondering what we would do about curtains.We have a LOT of windows, 24 in fact, and material is expensive. After looking around at various fabric stores we realized it would be over a hundred dollars for enough fabric to cover all the windows. We decided to try the goodwill down the road, they often have bits and pieces of disacreded fabric, maybe we would find something good ? Well, it must have been our lucky day because in the fabric bin was not one but TWO bundles of a very nice, natural looking, linen blend fabric. Each bundle was aprox 17 feet long and 60 some inches wide. Our grand toatal ? A mere twelve dollars for thirty four feet of fabric! Now, I just had to hand sew all 24 curtains ! As much as I always wanted to be, I have never been a good seamstress. I love the idea of creating clothes and stuff from fabric, and have tried many times to perfect this skill, or at least get started, but to no avail. My creations would always come out uneven or too big.There is just way to much mathematics and figuring involved . My brain seems to do better with more intuitive arts like sculpting, singing, weaving and spinning. None the less, we do need curtains, so I set to work at once, cutting and pinning everything in place, besides, maybe something will finally click this time with sewing. Lydia, our friend and neigbor came over while I was working and really wanted to help. I showed her how to pin the hems down and she pinned everything while I cut and measured. 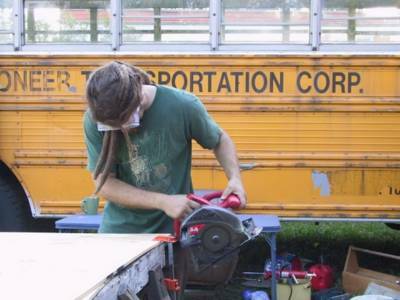 We had a great time pinning, cutting, and listening to Donovan while Moss cut boards for the wall . Lydia,who lives next door with her Grandmother ( Gregs wife ) is a very special little girl. She is only eight years old and is very bright. She loves the birds and is always wanting to make bird houses for Astra and Pipin,the starlings. She is also the only one (besides Moss and I) that Casper has ever allowed to touch him. I showed her how to work with him using treats and praise and she comes every day after school to help us on the bus and to play with him. They play peekaboo (Casper says "Peekaboo ! ", and hides his head), dance, sing ( yes, he sings too ) and play catch with the ball. Still, he will not sep up for her,but I wouldn't be suprised if she eventually gets him too. She is amazing with those birds, and so patient. She has other gifts too, like the aility to see spirits, and things that have not yet happened. On several ocasions Lydia has foretold things that there was no way she could have known. It's pretty much a fact around here that she has the gift of sight, just like her Grandmother, Elaine. Elaine is a full- blown natural psychic as well, and has predicted car wrecks, deaths, and has even on one ocasion helped a total stranger connect with their deceased daughter. They are remarkable people.One of the things I love most about traveling is all the neat people one has the oportunities to meet. When I am stationary for long periods of time, I seem to fall into a sort of rutt. Everything becomes so predictable and my possibilities limited.It's as though I am a horse with blinders on, allowed only to see what lies directly in front of me. When travelling, I am able to take the blinders off and open myself up to all possibilities and experiences. It forces one to live in the momment,where anything is possible and every choice you make can take you in a radically different direction. Here is the material we found for curtains,all cut and ready to be sewn. Lydia hard at work pinning the curtains. Me cutting fabric for bus curtains. So, I bet your all wondering what we did for Thanksgiving, right ? O.K, maybe not,but I'll tell you anyway. We spent Thanksgiving day proper (one of my favorite, by the way) with my dad in Sarasota, about an hour and half drive from here. The festivities really began however, on Wendsday with a trip to Busch Gardens. We went with my two cousins who live in Tampa Chucky and Craig. The three of us, and my other cousin Mathew and my cousins Janet and Joanne all grew up together and were very close in age. In fact, several of us were even born in the same year only a month apart. When we were kids the families would gather for holidays and reunions and we would all play together. We had some great times exploring the crik behind our house or playing at the park. It has been years since I last seen them and we had a wonderul time riding the coasters and catching up. Moss and I are both extreme roller coaster enthusists, and Busch Gardens did not dissapoint.They also had an excellent bird show and an exhibit with two unrelesable eagles, a Golden and a Bald. Thanksgiving day was spent with my dad and stepmom, Kathy and their friend, Marge.We had all the usual things, corn, potatoes, stuffing, and for moss and I a Tofurkey . We got most of the wall studds in and now we'll put a layer of plywood up all around. Anywhere the wall is showing, where there is not a bench or some other furniture, we will put the tounge and groove going horizontaly. We also decided to bring the wall halfway up the windows in some places. 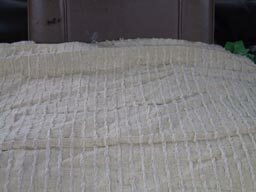 This will add an additional layer of insulation and wamth. 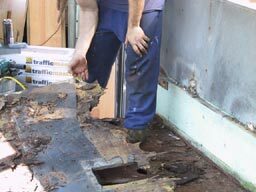 The problem we had was how to hide the insulation and wood so that it will not be visible through the window. 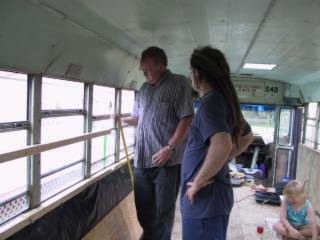 Maybe we could cover the windows on the outside with some sheet metal painted the color of the bus ? Wood trim was another possibility, though a bit more expensive. We finally decided we would tint the windows, some areas would be "limo black", and some just a light grey. So, off to the store we went to buy some tinting paper. Unfortunately, the stuff is not cheap, but we gritted our teeth and purchased 50 dollars worth , enough to do a few windows anyway. As we were about to put it on Greg came by and had an idea . "Why not just spray paint it black", he suggested. My first reaction was no way, it would look cheap and well,..like we spray painted our windows. A little later though we got to thinking. It's so funny the way he suggests things. Moss and I will be in there drilling, hammering and sawing, trying to figure it all out and in will walk Greg . He'll look around , make a few suggestions then move on. The thing is, his suggestions are always so simple and inexpensive I often do not beleive they will work ! I am just so used to a consumer culture that tells me if it isn'nt more expensive and more complicated than it must not be as good. Greg is teaching us differently. Point in case , the fresh water tank. Normally one buys a water pump to move the water through the lines from the tank, a one hundred and sixty dollar item. Greg, on the other hand, suggests we just presurize the tank with an air pump. 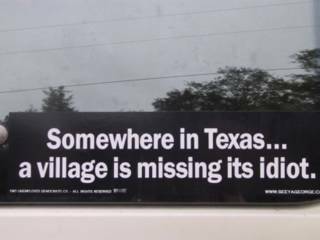 We may have to go do it a few times, but it would sure save us some money. Another example, our refrigerator. Usually, motorhomes are equiped with propane fridges, that is pretty much the standard, and that is what we were planning also. A small propane fridge costs at least three hundred dollars. Greg however, suggested we use an electric fridge and just give it its own dedicated batteries. I thought for CERTAIN that it would drain the batteries dry in hours, but it turns out it will not, as the refridgerator is not always on. In fact we will hardly even notice the drain on our batteries. Only one hundred dollars, instead of three hundred for a proprane one. I could give you at least five other similar examples relating to how his ideas have saved us money. Anyway, back to the paint..........we got to thinking, maybe it wont look that bad, and at 98 cents a can, as oposed to twelve dollars for six feet, how could we afford NOT to give it a try ? So I sprayed a small bit on the inside window then quickly ran around front to see how it looked while Moss held up the tinting stuff in another window. I compared. There was virtually no difference ! The 98 cent can of spray paint looked just as good as the twelve dollar- a six foot -roll of tinting paper. Moss and Greg discussing the best way to build up the walls. Wall showing where we built it up to partially cover some windows.The plastic acts as a vapor barrier. This last week has once again been very busy. We did a lot of running around, checking out salvage and recycling yards, rv stores and spending lots of time (and money, LOL) at Home Depot. On one trip to a local salvage yard, we found the most beautiful antique door. It was in an old, dirty, outbuilding,with literally hundreds of old doors stacked from floor to ceiling. We were flipping through one of the many upright piles when I spied this door, at the very bottom of the heap. "This is the the door of my dreams ! ", I cried (o.k, so I am a bit over dramatic) . 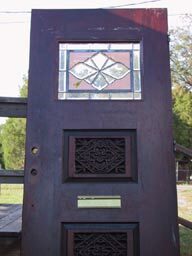 I had for some time envisioned an old wooden door with a piece of stained glass in it, in place of our curent standard bus door. This looked very similar to the one I had imagined ! It is heavy, probably solid mahogany . In the center is a beautiful stained glass piece and on the bottom are two separate, hand carved Indonesian style designs. It is very old, most likely from the 20's or 30's and must have been sitting there for quite some time . I was sure he would want a fortune for it. Luckily it already had a sticker on it indicating the price at 40 dollars. I couldnt believe how cheap it was, and neither could the owner, but he did honour the price. 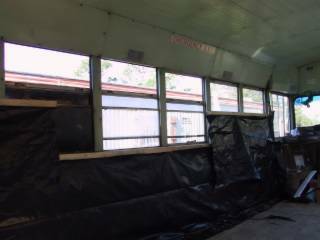 We will need to cut it down a bit to fit our bus, and make some other changes to the existing door frame, but it will look great . At that same place we found an rv bathtub for 60 bucks, not too bad considering they usually go for over a hundred. On a later trip to an rv surplus store we purchased a new rv oven /range and kitchen sink. Getting the pipes for the woodstove however, has been one expensive nightmare . We needed to purchase some insulated stove pipe and a leg for our Lopi Patriot stove, but they only sold through a dealer. Let me tell you, it is not an easy thing to find a woodstove dealer in Florida !! After searching around a bit we finally found one, but it was an hour away. We waited for six hours while the sales lady figured out what parts we would need for our stove, only to have the stove pipe manufacturer refuse to sell us the pipe because we did not want to buy the three feet of outside pipe he claimed we needed. Frustrated, we bought our stove leg and left. Luckily we were able to buy stovepipe frpom another place, not quite as far away. We bought triple walled to go through the ceiling, with about a foot of outside pipe, then single wall down to the stove. It will be a very safe set up. Total cost = 300 bucks !! Stovepipe is very exspensive. The stove will be on a small, raised platform, with a heat resistant wall on one side.We will tile the whole thing with broken bits and pieces we got from a local tile store. They gave them to us for next to nothing. I think we'll also do the walls and ceiling around the bathtub like that as well. Today was a beautiful fall day here in the Sunshine state. It was nice and cool with a good breeze,which made our work that much more enjoyable. My good friend Alan from C.A requested that we post a pic of the ceiling. Maybe he has some ideas for securing the 1x8x16 tongue and groove up there. Today, with the help of our neighbor friend Lydia ( Elaines grand daughter) we were able to put in the plastic sheeting,which will act as a vapor barrier. Moss got the plywood cut and we laid it in place. Tomorrow we will screw it all down. Finishing up with the subfloor is a big hallmark for us ! It finally looks and feels like we have accomplished something here. For about a week now there has been a sweet kitty hanging around here. 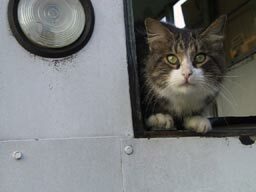 It seems he has decided to move in with us and likes to sit in the bus as we work. He even tries to come in the van at night to sleep. He was very hungry so we have taken to feeding him. It is pretty obvious that he is homeless, though was once very much loved. The neighbors believe he used to belong to a lady who lived alone down the street. Last week, about three days before he showed up, she was found dead in her house. They had it all roped off and cops everywhere. No one knows the cause of death, hopefully natural. We would like to take him with us but he has already tried to kill Joseph, the conure, twice . We are thinking maybe of just taking him to C.A with us. We know of a certain red headed woman in Newbury Park who may want to adopt her (wink, nod). Gaia (our dog) is enjoying herself here as well, especially the lake. Unfortunately I was informed recently that there is a five foot alligator that enjoys the lake as well, so no more lake for Gaia. I have been trying to get Moss to post something here, but he insists he does not write well and that I should write all the posts. I think his writing style is fine though, and that the difference in our styles would make it more interesting. I'll keep working on him. 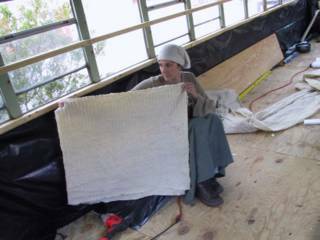 Me and my friend Lydia, putting down the plastic vapor barrier. Here is the roof pic, Alan ! 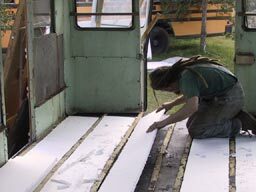 Moss cutting plywood for floor. 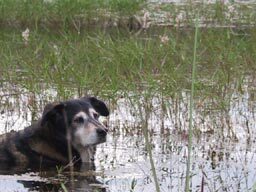 Gaia relaxes in the lake outback. Ready to go guys !! Our sub floor complete !! Our floor and ceiling wood has arrived !!! It's so beautiful !!! We shoped around quite a bit to find the right wood and prices . 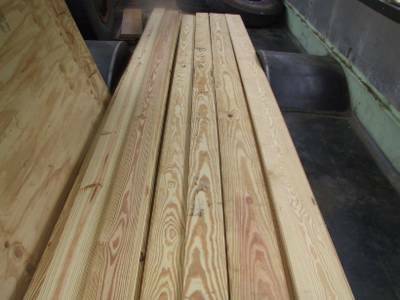 Amazingly we were able to find 1x6x16 tounge and groove hard pine for nine dollars a board. That price is SO good. We were assured from the compny that it is tree farm wood, as we do not believe in disrupting natural forest eco sysyems to obtain lumber. Let "em plant tree farms !!! Hopefully, they were telling us the truth. For the ceiling we will use 1x8x16 tounge and groove,we just need to find a way to secure it to the ceiling.So,..if anyone has any ideas.......... We will probably need to bolt it through the roof. 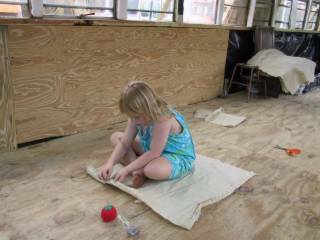 Today we are working on the floor insulation,then we'll do the plywood. 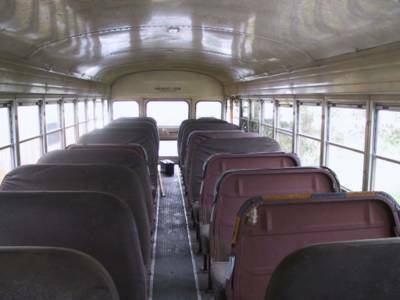 Greg had drive up North to pick up a school bus and deliver one to another place. He all over the country to buy buses then fixes them up and re sells them. He'll be gone for a few days, but we have plenty to do until he returns. Hopefully he'll be here for the electrical stuff. It feels so good to be learning as much as we are. Moss and I actually have very little experience with construction related things, so this is a big education for us. One great thing is that when we are done we will know how to fix everything and where it all is. The weather is still nice and cool, but the mosquitos are HELL ! I worry so much about the birds getting West Nile. Right now they are outside in their big cages during the day and in the car at night in their small cages. I will be releived when we can get them inside for good. Our beautiful, hard pine, tounge and groove flooring !! Moss working hard on the insulation for the floor. The last few days have found us real busy, we have accomplished quite bit. We had taken off the side panels a few days ago, and now have installed a layer of R5 foam insulation. Later we will add yet another layer, as well as insulation for the floor and ceiling. 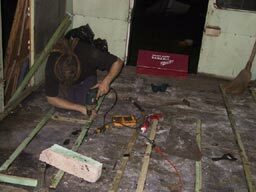 We then set about building the sub floor. 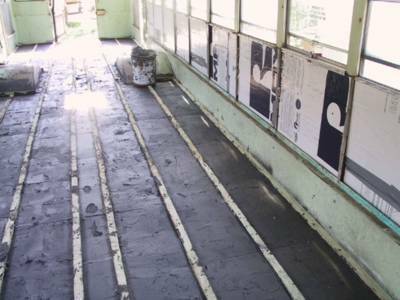 First we bolted a series of 1x2 studs to the floor, then we tarred the whole thing with roofing tar. 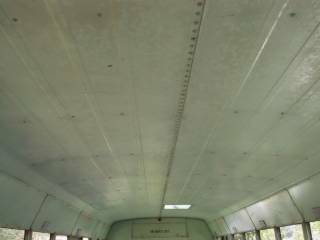 School buses are known to have serious condensation problems, so taring the floor was real important in keeping out water and helping to create a vapor barrier. The weather has been a bit cooler, which has made it so much nicer to work and sleep in. Our days usually begin around 7:00 am. We emerge from our van, enjoy a cup of Yerba Mate while listening to Air America on our XM satellite radio. We then set to work,often putting on some good tunes to move us along. Bluegrass is a fovorite, usually Bill Monroe or the Osbourne Brothers . Donovan, of course is also a favorite as well as Moody Blues,radiohead or Grateful Dead . Yes, music is a huge part of our working on the bus, and we have a lot to chose from. We stop for dinner around 5:00 and often go back to work, or will visit with Elaine, Gregs wife and chat a bit. She is so sweet and will often bring us over homemade mac and cheese for lunch. She also has offered to let us take showers in her house,which has been SO great. It is amazing how filthy we get in just one day of work. Moss instaling the 1x2 framework for the floor. 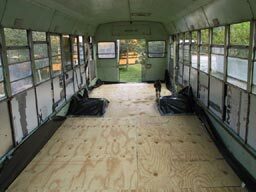 Here is a pic of the tared floor and insulated side walls. After several days now of depression and hopelessness ( I had to convince Moss it was NOT a good idea to move to Canada, LOL) we are back in the swing of things. We are trying to look at the bright side, and how at the very least folks will now be really ready to pull together and mobilize. I predict massive demonstrations and civil disobedience in the coming years and that we will become stronger for this in the long run. Here you can see where we had to cut and bolt a new sheet of steel in place. 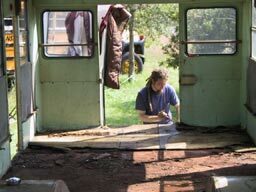 Me sanding the rusty floor. Moss working on getting the last piece of plywood off the floor. Indeed, Moss and I are devestated, mortified, and in shock. I cried today. Cried for our soliders that died, for those that will die, for the innocent Iraqis and all the other nations our insane president will declare war on. I cried for mother earth too, all the beautiful wild animals that share this land with us, some on the verge of extinction whose existence will now be even more precarious. I thought of my beloved ancient forests in the Pacific northwest, the tall old growth trees, the strong flowing streams, some still containing salmon. I thought of our rights as citizens, how imortant is our constitution and civil liberties, all threatened now. A womans right to chose,freeom of religion, the rights of some folks to marry and the war that will be waged on this countries poor and middle class. We can kiss it all goodbye,thanks to the re election of George W Bush. He really is an idiot..
Not a whole lot to say today, just chipping away at that floor and listening intently to the election results via our XM satellite radio. Get out and vote today !!!! Kerry/Edwards all the way !!! Moss and I have finally gotten all the seats out, only to discover that the wood floor is seriously rotted, and the metal beneath is rusted through in some spots. 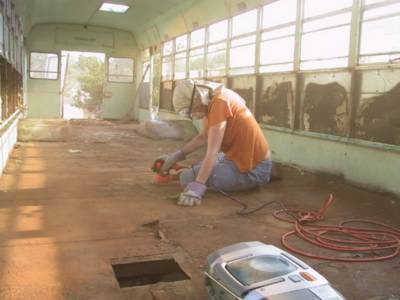 So, we will have to rip up all the plywood, sand the entire floor and apply rust converter. Then we'll need to reinforce some rusted out areas with new metal. Whew..... we have our work cut out for us. With his hand in the pockets of the timber,mining and oil industries, he cares little for the ecosystem of this beautiful country and believes it is not the job of the u.s goverment to go out of their way to protect it. I disagree strongly.Private industry and citizens clearly may not always have the welfare of the local eco sytems at heart, nor the knowledge and understanding of how it works. They cannot and should not be entrusted with this very important responsibility. 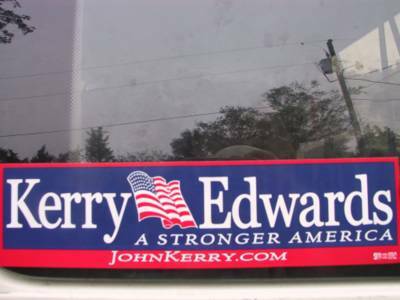 So please go out and vote for Kerry/Edwards tomorow, for the above reasons,and many,many more. Educate yourself on the issues at hand, dont just believe whatever crap they shovel you. 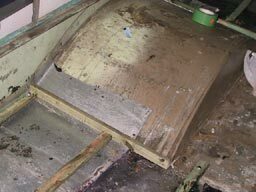 This is what we found when we took out the seats.The wood was rotted through and the metal badly rusted.